It's been two years since John McLaughlin released the highly acclaimed To The One (ABL 21) - his first studio recording with The 4th Dimension, the veteran guitar innovator's second longest-standing group since the east-meets-west fusion of Shakti. 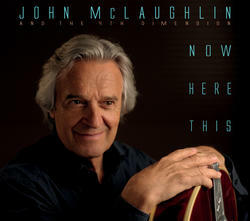 Comments like "…listening to his improvisations…leaves no doubt that (McLaughlin) is in inspired creative form," (Ian Patterson - AllAboutJazz.com), and "…this tight 40-minute document hums with a collaborative energy." (John Fordham - The Guardian) left little doubt that McLaughlin's return to the electrified fusion he first innovated more than 40 years ago in groups led by Miles Davis and Tony Williams - and, of course, with his own earth-shattering Mahavishnu Orchestra - was as inimitably electrifying and exhilarating as ever.